Talk of a wall and the ban regarding Muslim refugees is everywhere. Immigration has become one of the hot bed topics currently raging in America. On social media, people are growing increasingly creative with memes that call our attention back to 1930s and 1940s Germany, a time of intolerance, an era when people – specifically Jews – were slaughtered because one man deemed them responsible for society’s ills. That one man, playing the discontent of others like a fined tuned fiddle, sparked a fire of hatred and rage that spread through Europe. Millions died. And those who survived spent the rest of their lives haunted by the past. During this time of the Second World War and the years preceding it, people all over Europe fled their homes, searching for work, fleeing persecution or trying to figure out exactly where they belonged amidst the chaos. Men and women emigrated to foreign countries, including England and America, searching for something better, but oftentimes finding only isolation and loneliness, or a yearning for a more innocent, simplistic past. Considering the political climate in the United States, W.G. 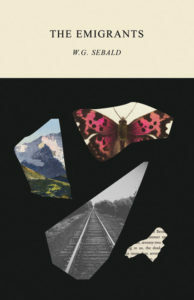 Sebald’s novel, The Emigrants – originally published in 1992, but reissued now, along with The Rings of Saturn and Vertigo, by New Directions – is a timely read. The Emigrants is divided into four sections, each one documenting the life of a man no longer living in the country of his birth, men who in the twilight of their lives can find no peace with the past, no happiness in the present. While the book is categorized as fiction, each story reads like a personal narrative, an intimate encounter between the narrator and his subjects. To enhance the illusion that these stories are true, Sebald had embedded black and white photos throughout the narrative. This allows the reader to further peer into the character’s lives and glimpse more clearly the worlds in which they lived. In the first section, we meet Dr. Henry Selwyn. The narrator happens upon his house while searching for a room to rent. At first, the narrator doesn’t see the elderly doctor, who has withdrawn not only into himself but into the disarray around him, the garden that has begun to grow wild. But over time, the narrator becomes Selwyn’ confidant, the one person to whom he can divulge the origin of his sadness. In recent years, Selwyn has grown homesick and in a moment of nostalgia he reminisces, “I see….The high seas, the trail of smoke, the distant grayness, the lifting and falling of the ship, the fear and hope within us, all of it (Dr. Selwyn told me) I can now live through again, as if it were only yesterday.” Fear and hope are common emotions among emigrants, people setting out from their homes in search of something better. And for much of his life things were good – good schools, enjoyable holidays, and a rewarding career. However, seven decades after he left Lithuania as a boy of seven, he finds it hard to live in the present, his mind continuously returning to the land and the childhood he long ago left behind. He was German to the marrow, profoundly attached to his native land in the foothills of the Alps, and even to that miserable place S as well, which in fact he loathed and, deep within himself, of that I am quite sure said Mme Landau, would have been pleased to see destroyed and obliterated, together with the townspeople, whom he found so utterly repugnant. Loving a country he hated, educating children whose families had cast him out, eventually destroyed Bereyter, and when he could no longer live with the memory of it, he surrendered himself to an oncoming train. Section three carries the narrator to New Jersey to visit relatives who fled Germany before the War. While there, he stays with an aunt who tells him about his Great-Uncle Ambros Adelwarth. Adelwarth, though lacking a formal education, was highly intelligent, as is demonstrated by how readily he learned a multitude of languages. His personality, temperament, and the way he interacted with others, denoted much dignity. Intrigued by Adelwarth’s life, the narrator eventually returns to America, this time to track down the dilapidated mental facility in which Adelwarth died, a victim of depression, memories haunting him until the end. The final story revolves around a painter named Max Ferber whom the narrator meets in Manchester, a seemingly dark and desolate city in England, the hallowed out remains of the city that led the Industrial revolution. As a teenager, Ferber, a Jew, fled inevitable persecution in Nazi Germany. His parents intended to follow, but instead of a flight to England, they ended up on a deportation train. Ferber never saw them again. And so he lives alone, painting in a dark studio as if hiding from the guilt and loneliness of his survival and exile. Memory…often strikes me as a kind of dumbness. It makes one’s head heavy and giddy, as if one were not looking back down the receding perspectives of time but rather down on the earth from a great height, from one of the towers whose tops are lost to view in the clouds. Here in America we think in terms of immigration, people coming to us. All too often, we lose sight of the fact that these men and women were emigrants first, leaving a place they may have loved. We focus on their expectations, their dreams of a new life, and we have written history in a way that highlights what they are running towards. As a result, we often forget or overlook the reasons they fled, the shadows in pursuit, and the memories that may never stop haunting them. The Emigrants is a reminder that many immigrants are burdened with experiences that we are fortunate not to have endured. Elizabeth Jaeger earned an MFA degree in creative writing from Fairleigh Dickinson University. Her essays and fiction have been published in Boston Accent Lit, Damfino, Inside the Bell Jar, Blue Planet Journal, Italian Americana, Yellow Chair Review, Drowing Gull, Icarus Down Review, Linden Avenue Literary Journal, Atticus Review, and Literary Explorer.